The Pyrenean Mountain Dog is present in the Pyrenees originates from France and belongs to the family of molossoids of mountain type. It is a beautiful and very elegant and at the same time extremely large, impressive, and strongly built dog, basically white, that has been a dedicated companion of the shepherds and their families and guardian of their flocks for many centuries. The Pyrenean Mountain Dogs, as they are called in the United Kingdom and the Continental Europe, got their name from the famous mountain range in southwestern Europe, where these dogs have been used for many years as guardians of the sheep flocks. In the U.S. they are also known as “Great Pyrenees”, while in their hometown, France, they are called “Le Chien de Montagne des Pyrénées” or “Le Chien des Pyrénées” or simply “Patou” and in the neighboring Spain “Perro de montaña de los Pirineos” or“Montaña de los Pirineos”. The breed is said to be coming from a group of mountain flock guard dogs that appeared about ten thousand years ago in Asia. As for their entrance in Europe, these dogs must first have appeared in the Pyrenees Mountains, around 3000 BC, where they arrived together with their shepherds and their flocks. In the inhospitable, wild and isolated mountain range of the Pyrenees, these dogs developed, over the centuries, those characteristics that made them unique to the category of flock guardians. Rather than a molossoid, the Pyrenean Mountain Dog is a lupomolossoid. Although there has certainly been some cross breeding over the centuries, the Pyrenean Mountain Dog is not considered to belong to the “mastiff” family. Before the French Revolution, around 1400, we have the first references to French texts proving the recognition of the value of the Pyrenean Mountain Dog on the French court, as a flock protector extremely popular. Besides, its widespread use as a guardian dog at the great palaces of French nobility is very characteristic. Actually, the first detailed description of this breed dates from 1897 in the book by Count de Bylandt. It is worth noting that in 1675, during Louis XIV’s days, the Pyrenean Mountain Dogwas adopted as the Royal Dog of France and as a result, this dog was in the greatest demand by the aristocratic class. Having an excellent sense of smell and very good eyesight, each dog was equivalent to two men, either as a guardian of the castle or as a valuable companion of shepherds. The strongest rumor linked to the Mountain of the Pyrenees, was and remains the eternal devotion and the special bond with their flocks, the shepherds and their families. The Pyrenean Mountain Dog appeared in the American continent in 1824, when General Lafayette imported two male dogs in order to offer them to his friend J.S. Skinner. In 1850, Queen Victoria of England also obtained a Pyrenean Mountain Dog. However, it was only in 1909 when these dogs were introduced to England for breeding purposes by the daughter of Lord Roseberry. It is a wonderful combination of elegance, exceptional beauty, nobility, intelligence, huge size and magnificence. Well-furnished and highly resistant to adverse weather coat with a thick undercoat and a long external coat, crisp on the shoulders and back, longer on the tail and around the neck where it is usually a bit wavy, white or white with patches of grey color (badger’s or wolf’s hair, which is the most appreciated) or pale yellow or orange, on the head, ears and at the base of the tail and sometimes on the body. It is insightful and is characterized by a gentle, dignified and royal expression. Especially impressive, demonstrates a unique style and elegance to its movement, while the strength and his coordination exude confidence, deep devotion and power and undoubtedly indicate the purpose for which it has been raised, namely the laborious job of guarding the flocks, regardless of weather conditions on the steep slopes of the Pyrenees. The height of the Pyrenees Mountain (to the withers) in males ranges from 68 to 81 cm and females from 63 to 73 cm Weight of a male 68 cm is about 45 kilograms and a female 63 cm approximately 40 kilograms. The weight is proportional to the total size and structure of each dog. The head is heavy but not too large in proportion to the size of the dog. It is wedge-shaped with slightly rounded top of head. The expression is elegant, serious, calm, intelligent and thoughtful. The eyes are medium sized, almond-shaped, set slightly obliquely and dark brown. The eyelids are characterized by the black outline and they are never loose. The ears are small to medium, triangular with rounded tops, starting at eye level and usually falling flat against the head. There is a characteristic spot where the hair of upper face meets with that of the lower forming a line from the outer corner of the eye to the base of the ear. The muzzle is approximately equal in length to the back skull. Seen from above it forms a blunt ‘V’. The width and length of the skull are almost equal. The cheeks are flat. There is a sufficient fill under the eyes while between the eyes is a small groove. There is no obvious “stop”. The lips are tight, with the upper lip slightly covering the lower lip. The lower jaw is very strong. The nose and lips are totally black. The denture must be complete and teeth healthy and white. Scissor bite (upper incisors overlapping lower incisors without losing contact) is the most appreciated, but the pincer bite is acceptable too. Imperfections including the very heavy head, too narrow or small skull, visible “stop”, poor coloration of the nose, the contour of the eyes or lips, the round, triangular, loose or small eyelids and crooked or protruding mouth. It has a strong neck, medium length and a small dewlap. The chest is fairly broad. The sides are quite visible, oval and enough depth to reach the elbows. The back and loin are wide enough and tied hard. The croup is slightly sloping and the tail is long, bushy and starts just below the height of the back. Shoulders stand well back, well muscled and are close to the body. The top of the front leg forms a nearly right angle with the shoulder bone. The length of the shoulder bone and the upper front leg are almost equal. The height from the ground to the elbow appears approximately equal to the height from the elbow to the withers. The front legs are quite long and muscular. The elbows are close to the body. The front legs, when one looks from the side, are just below the withers and are straight and perpendicular to the ground. The elbows, when one looks from the front, are a straight line from point of shoulder to wrist. The front paws are rounded, well and fingers coated with a good arch. The articulation of the spine is similar to the front. The upper thighs are very muscular and have the same length as the lower thighs. The metatarsus is medium length and perpendicular to the ground when dog is standing naturally. The back legs are quite heavy and muscular. The special characteristic is that the hind legs have double well-formed dewclaws. The front legs sometimes have single or double dewclaws. Highly resistant to adverse weather conditions. It consists of a long and thick outer coat, straight or slightly wavy (curly coat considered as a defect), below which there is a dense undercoat. It is quite richer around the neck and shoulders, creating a short of mane and longer on the tail. The hair is either white or white with grey spots (badger hair, which is the most appreciated) or pale yellow or orange on the head (sometimes entire face), ears and base of the tail and sometimes the body. If the patches and the colors cover more than one third of the body, this would constitute an imperfection. Its move is mild and elegant, powerful and upright, showing strength and agility. The steps are balanced, with good opening. The comfort and the ability of motion are more appreciated than speed. The character and temperament is of great importance. 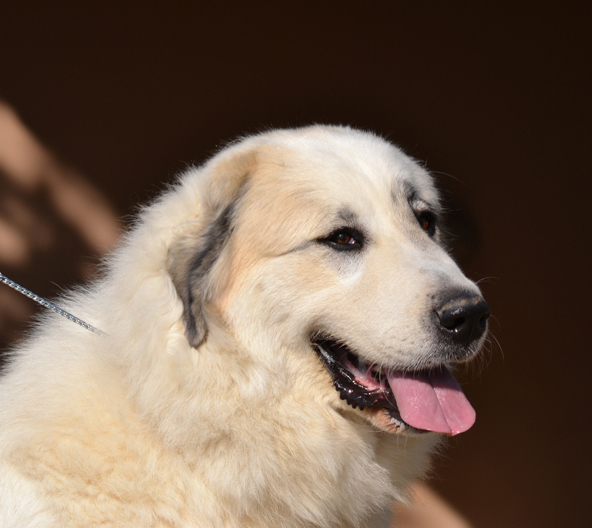 By nature, the Pyrenean Mountain Dog is confident, calm and affectionate. While chasing the region and protects the shepherd and its family when necessary, the general behavior is characterized by calm, patience and tolerance. It has a strong will, independent and somewhat reserved, yet focused, fearless, and devoted to its duties. Although the Pyrenean Mountain Dog may appear reserved, any sign of excessive shyness, nervousness or aggression to humans is unacceptable and is considered particularly problematic. It needs love, fellowship and family life (lack of social life leads the Pyrenean Mountain Dog in antisocial behavior and depression), a lot of free space because it is large enough, daily exercise and special care of its rich coat, which sheds much when changing. Although it belongs in healthy dogs, those intended for breeding should be tested for hip dysplasia, eye diseases, skin prone to eczema and very rare epilepsy. The metabolism and body temperature is lower than most dogs.